This cake takes me back to Sunday dinners at my grandparent's house when I was in elementary school. 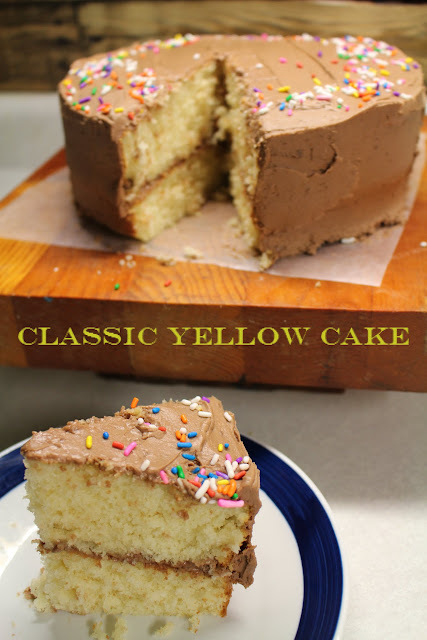 Yellow cake...or butter cake, with chocolate frosting! My grandma would make a butter cake for no particular occasion. Just whenever the mood struck. That's what I loved about her and her baking. There was no reason to have a delicious dessert. The only reason was just to satisfy a sweet tooth. Nothing is more comforting than butter, chocolate, and sprinkles. I mean pretty much nothing. Except when they are combined together into a delicious thing called cake. The best thing about this particular cake is that it is virtually impossible to mess up. Golden layers wedged between glorious chocolate frosting is enough to put a smile on anyone's face. Whenever I make it, it instantly returns me to those childhood memories of enjoying it at my grandma's dining room table with my dad and grandparents. Now I get to make it with my daughter, who looks forward to eating it as soon as it comes out of the oven! Waiting for it to cool enough to frost is a painful span of time. Of course we fight over who gets to put the sprinkles on. I mean, she just assumes since she is seven that she has sprinkle duty by default due to her age. Ummm...no. I let her do it. Then I typically add more. Just to even it out. You know...for aesthetic purposes. "You eat with your eyes first." -Grandma's words ringing in my ears when I cook or bake anything. No birthday is complete without a simple yellow cake. I'm pretty sure I must go bake one right now. So what if it is 8pm on a Wednesday. Celebrate that we made it mid-week? Prep 2-8" or 9" cake pans with shortening and flour; set aside. Cream together the butter and sugar in a stand mixer or with a hand mixer until fluffy. Add the eggs, one at a time and mix until well combined. Beat the flour, baking powder, and salt until no flour streaks remain. Slowly mix in the milk and continue to mix until the batter becomes smooth. Pour the batter into the prepared pans and bake for 20 minutes, or until toothpick inserted near the center comes out clean. Remove from the oven and let cool on a wire rack for 10-15 minutes before inverting to finish cooling. In a small saucepan, heat the heavy cream until it bubbles around the edges. Pour the warm cream over the chocolate in a mixing bowl. Let the cream and chocolate stand for 5 minutes to allow the cream to melt the chocolate. Whisk the cream and chocolate together until glossy, or mix with a mixer. Beat in the vanilla and then the powdered sugar until it reaches your desired spreading consistency. When the cake is cooled completely, frost the top of one of the cakes, layer the other cake on top of it. Frost the sides and the top of the cake.